UIC clinical instructor Lindsey Strieter (center) talks to a group of Altus Academy students during a lesson on breakfast in the UIC Health and Wellness Academy. “Today we’re going back to breakfast,” Lindsey Strieter tells a group of middle school students in the Altus Academy cafeteria. “Do you remember why breakfast is important?” asks Michelle Reich. Strieter, a clinical instructor in the College of Applied Health Sciences, and Reich, a registered dietitian and UIC alumna, are kicking off the day’s lesson in the UIC Health and Wellness Academy, a program of the college’s physical therapy department that collaborates with schools in Chicago to teach kids about healthy decision-making and encourage healthy behaviors. 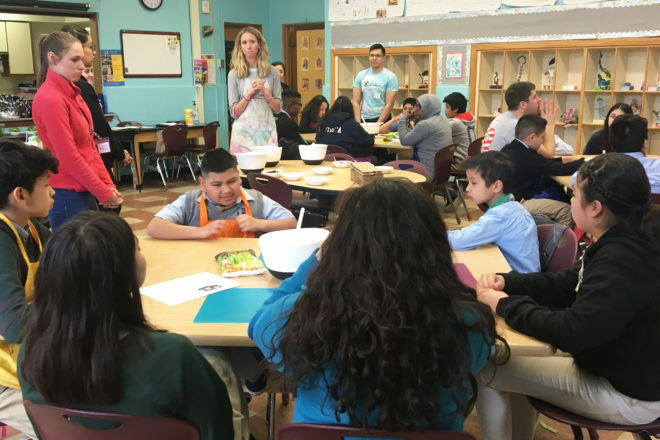 Eating breakfast is the focus of the lesson because Strieter and the 13 UIC students running the wellness academy have noticed that this healthy behavior is one many of the Altus students ignore. The “green stuff,” the kids learn, is the spinach they will use to make a healthy breakfast smoothie. “The lessons we teach in the Health and Wellness Academy are built by UIC students to address the needs, likes and dislikes of the kids from partnering schools,” Strieter said. 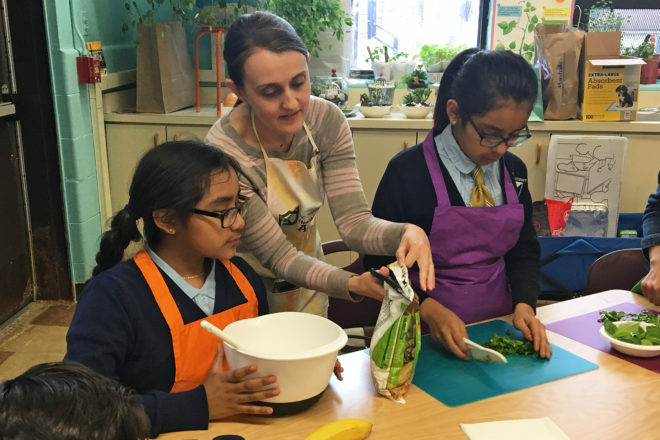 AHS alumna Michelle Reich (center) helps middle school students make a breakfast smoothie during the UIC Health and Wellness Academy. And it’s exactly that — the personalized lessons — that makes the wellness academy such a valuable program for the participating schools and the UIC students. 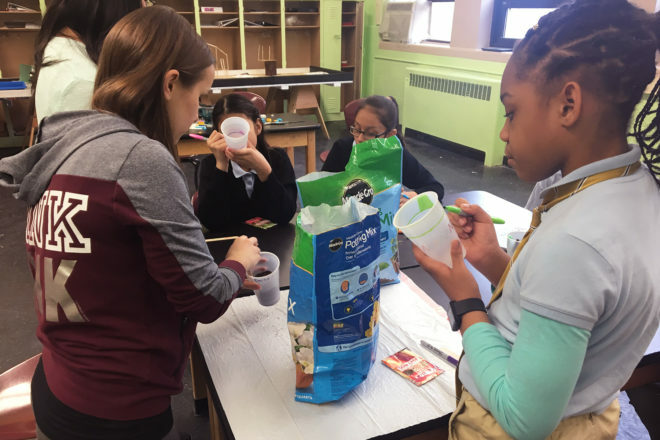 Altus Academy, an independent, private, not-for-profit school, is the second school to work with UIC’s Health and Wellness Academy, which first launched in 2016 with Smyth Elementary School, a public Magnet school in Chicago. Thirty-two UIC students are currently involved in the program at Smyth. Altus, which does not charge its students tuition, serves the North and South Lawndale communities. Altus principal and founder John Heybach says the wellness academy fits nicely with his school’s focus on the community and family unit and the needs of his students. AHS kinesiology student Kathryn Marie Garrido (center) leads a small group of Altus Academy students in a self-esteem-building exercise. Just one floor below the breakfast lesson in the cafeteria, another group of Altus students is participating in similar wellness and physical activity lessons. Kathryn Marie Garrido, a senior in the kinesiology program, asks a small group of students to sit in a circle. “Please look at the person next to you. I want you to write down one nice thing about that person and pass your paper to them,” Garrido says. Julie Niewiadomska, also a kinesiology student, helps the kids plant vegetables for the Altus garden. 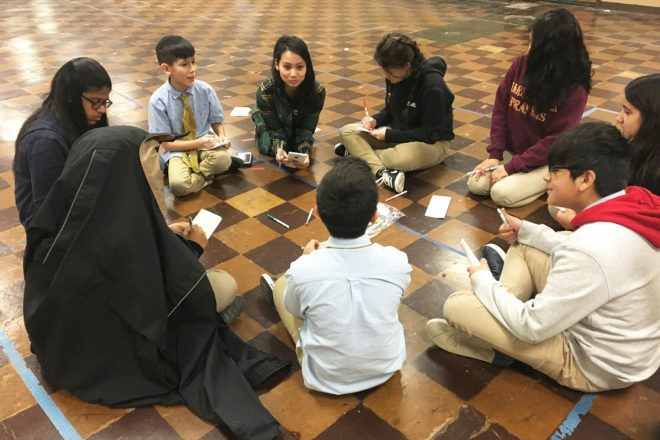 Nearby, Mariana Reyes is helping the middle school students put together skits that highlight healthy behaviors. Reyes, a UIC senior entering the occupational therapy program in the fall, has passed out three prompts to the students, who have broken into groups and developed and performed the skits. Reyes’ questions relate directly to the lessons she is learning as part of her UIC coursework. AHS kinesiology student Julie Niewiadomska (left) helps middle school student in the UIC Health and Wellness Academy plant vegetables for the Altus Academy garden. Standard Two from the CDC advises that students should learn to analyze the various influences on health behavior, from media and technology to friends and family. Students in the College of Applied Health Sciences participate as mentors and facilitators in the Health and Wellness Academy by registering for the elective course, which provides three credit hours toward their degrees. The course, offered in fall and spring semesters, consists of one day of lecture and three different lab practicum options in which the students work with Chicago schools. Reyes says working with the program is helping her figure out what age patients she would like to work with as an occupational therapist. “I’m not sure yet if I want to work with kids in my career, but this experience is helping me to understand what that might be like and gain needed hours interacting with the community,” Reyes said. Strieter says the department hopes to expand the program in the future. When asked what his favorite class is, Isaiah, a second-grade Altus student said, “Math. No, wait. Is this a class? This one is my favorite.” Maybe, he’ll even start eating breakfast.